The two founding members of Echoes Of Eternity, Brandon Patton and Kirk Carrison, have a death metal background, but in 2005 they decided to try something different. They also wanted their new band to have a female singer, which turned out to be Francine Boucher. 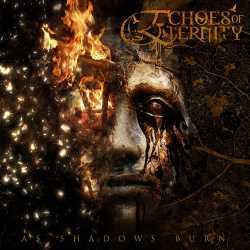 Since then they have released their debut The Forgotten Goddess in 2007 and now their second effort As Shadows Burn. The band labels their genre as progressive metal, which I can’t really agree with. They play rather classic heavy metal, although their mid-tempo excursions on Veiled Horizon and Descent Of A Blackened Soul also allow for occasional doom and gothic elements. It is absolutely laudable that the musicians set no stylistic boundaries for themselves, but unfortunately this doesn’t save their album. One reason is the songwriting that never breaks out of its mediocrity, even at times feels rather awkward. Ms. Boucher would have done a better job with her firm voice if it weren’t for the skewed notes that time and again come up. Halfway through the album, their ideas tend to repeat themselves, which doesn’t improve the listening experience either. At least they don’t try to copy better known female-fronted bands like Nightwish, but try to do their own thing. The CD ends with the lengthy instrumental Funeral In The Sky which also doesn’t fit into their concept. Those who like powerful melodic metal with female vocals might get something out of As Shadows Burn, a basically well meant effort that does unfortunately not live up to its promises. There are bands professing the same attitude that are more interesting: Tristania, Arch Enemy, Kittie and of course Warlock are just a few that deserve to be mentioned.